Did you know that George Washington was appointed county surveyor of Culpepper County, Virginia at age 17? And that he had a lifelong interest in the lands of the upper Ohio River, including the Parkersburg/Williamstown/Marietta area? I didn't. His surveying experience and youthful ambition for military service prompted him to volunteer in the French and Indian War. In 1753, Washington, at age 21, was chosen to deliver an ultimatum from the British to the French at Fort LeBoeuf. He kept a journal of the adventure, complete with a map of the route. Publication of the journal brought international recognition to him. Portrait by Charles Willson Peale. 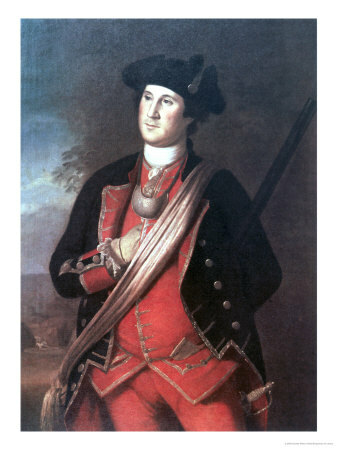 Painted in 1772, it depicts Washington as colonel of the Virginia Regiment, and is his earliest known likeness. His war service in the Virginia Regiment earned him land grants in the Ohio River valley. He explored the area in 1770 and eventually acquired substantial land holdings. He believed the area had great potential for development - and for substantial financial gains. The land grants for Virginia Regiment veterans were authorized in 1754 by Virginia but later superseded by a Royal decree prohibiting such grants west of the Allegheny mountains. George Washington lobbied persistently on behalf of the war veterans (including him). Eventually the land grants were approved. He arranged for an expedition by canoe to identify suitable land along the Ohio River from Pittsburgh to the Kanawha River (then the "Great Kanawha").The group included Pennsylvania surveyor William Crawford and a fellow veteran Dr. James Craik, along with several servants and Indian guides. The river junction - where the Monongahela and Allegheny form the Ohio - that became the focal point of British and French claims to the region. October 15: Visited a coal mine in Pennsylvania near Col. Crawford's house. "Coal seemed to be of the very best kind, burning freely and an abundance of it." 19: At Fort Pitt he met with Seneca Indian Chief White Mingo and other chiefs of the 6 Nations. They welcomed him to their country and desired that the "People of Virginia consider them as friends..." and trading partners. Washington responded in a favorable manner. 20: Began their trip on the Ohio River. "We Imbarked in a large Canoe with sufficient store of Provision and Necessaries..." Besides Washington, William Crawford, and Dr. Craik, there were several others in the party, including 2 Indians to act as scouts and interpreters. 25: Passed Fishing Creek, south of New Martinsville: "contains some bottoms of very good Land" including "the largest Flat I have seen upon the River." 25: Camped about halfway through long reach of the Ohio River (probably near or opposite New Matamoras). Put out fishing lines at night and caught a catfish "the size of our largest River Cats, tho' it was of the smallest kind here." 26: Camped just above mouth of Little Muskingum creek. A plaque in Reno, Ohio notes this event. 27 Passed Muskingum River, "150 yards wide at the mouth,....navigable a great way into the Country for canoes." 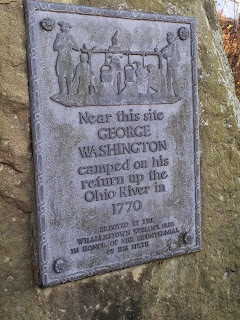 28: Below Hocking River he visited the camp of Gayasuta, one of the 6 Nations chiefs who as a young hunter had accompanied Washington on the mission to Fort LeBoeuf in 1753. "He had expressd a satisfaction in seeing me, and treated us with great kindness; giving us a quarter of a very fine Buffalo." Gayasuta reiterated his wish (from earlier meeting at Fort Pitt) for Indians to trade with Virginia residents. Washington describes the formality of the visit as gracious but "tedious" and was anxious to move on. 30: Explored Kanawha River about 10 miles upriver from Ohio. Went hunting; killed 3 buffalo and 3 deer. "This country abounds in buffalo and wild game of all kinds." Saw birds in size between goose and swan, "the cry of these was as unusual as the Bird it self." November 3: Began return trip up the Ohio. Marked trees (tomahawk claim) to establish claims to land along Ohio River north of the Kanawha River as part of land for Virginia Regiment veterans. 5: Walked part of bottom land in Great Bend of the Ohio (part of Meigs County) - "the land as high, dry, and level as one could wish." 6-16: Pages for these dates in his journal were chewed by mice and so were not reproduced. Some activities were gleaned from what was legible, notably that starting on the 8th he walked along bottom land from the Little Kanawha almost to the Muskingum River. 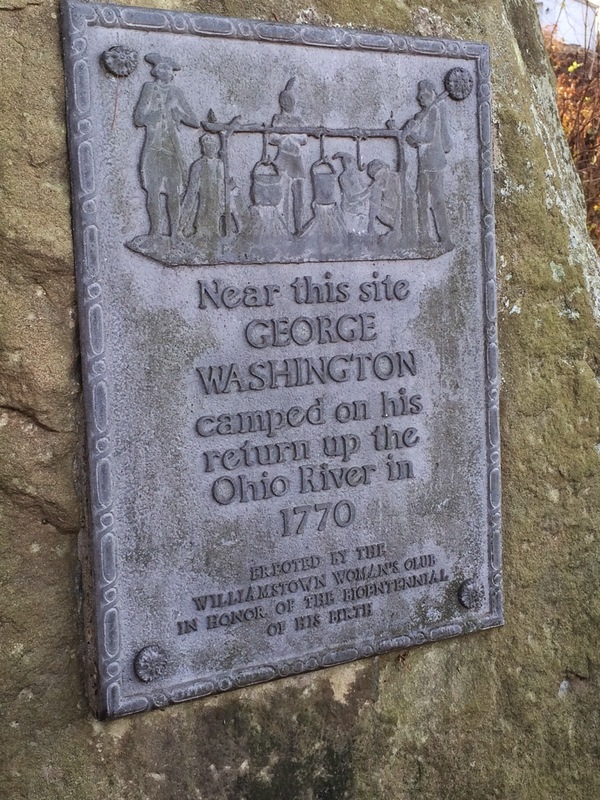 There is a plaque in Williamstown WV noting that George Washington camped in the area. The author does not mention that in his notes about the journal. But journal does identify the party as being in that area. 21:Reached Fort Pitt. Reached his home at Mount Vernon on December 1. Washington believed the Ohio River and Kanawha River areas had excellent potential for future settlement. However, he notes in the journal that assembling large tracts would be difficult due to Indian settlements and claims by Virginia residents already made in some areas. He eventually acquired for himself 10,990 acres along the south bank of the Kanawha River, 4,395 acres on the east side of the Great Bend, 2,448 acres on the current site of Ravenswood WV, and 2,314 acres near the Little Kanawha River -the tract known locally Washington Bottom. The latter land on the east side of the Ohio River extended from Blennerhassett Island to the island just north of the Little Kanawha. George Washington never realized the development potential or price appreciation that he expected. He tried throughout the 1780s to sell or lease the land. Much of it ended up in his estate when he died in 1799.